The twenty-fifth Andrew Barnett Memorial Lecture takes place on Thursday 9th October at 7:30 pm in St. Andrew’s Church, Bilston Street, Sedgley. The speaker is Mary Bodfish, a favourite with local history groups and Chairman of Smethwick Local History Society. Mary’s illustrated talk portrays the family tensions caused by the English Civil War as it ebbed and flowed around Birmingham (‘battle’ in April 1643), Wolverhampton, Walsall and Dudley (castle sieges in 1644 & ‘46) – local people took sides and there was much upheaval and damage. The arms of Dudley Metropolitan Borough Council were granted in June 1975. There are elements from the old County Borough arms as well as from the different authorities subsumed into the ‘new’ Dudley. The key elements from Sedgley’s badge and Coseley’s arms are the Beacon Tower and Stafford Knot set at the top of the Borough coat of arms. Both towns were in Staffordshire. 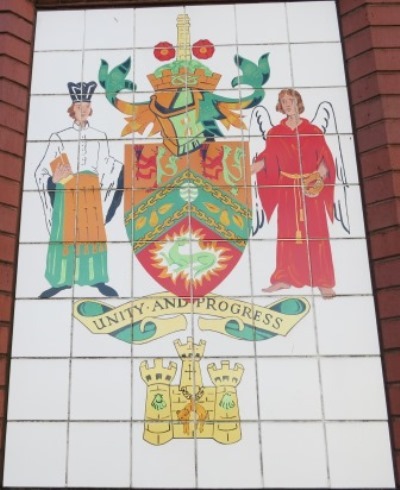 The tiles took pride of place on the rear wall of a toilet block at the north end of Dudley’s Market Place. The 1980s building was demolished in the first week of July 2014 to give a clear view of the castle and make way for the redevelopment of the market facilities. The fate of the tiles is unknown.